When the urge strikes, you just gotta do what you feel, right? Hank and Rumi agree, and they’ve gone out of their way to help you indulge those urges. 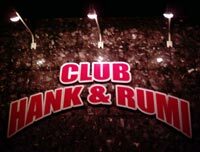 Club Hank & Rumi offers karaoke and dance, but more importantly, it has an atmosphere that guarantees relaxation. The husband-and-wife duo got the idea for Club Hank & Rumi two years ago after getting tired of going from place to place, trying to find the ‘perfect’ spot to sing, dance and unwind. Karaoke is king four nights a week, with thousands and thousands of songs available. There are more than 13,000 English selections alone, and Rumi says she doesn’t think it possible for a patron to not find at least a few favorites of one genre or another. The couple adds new tunes every month, and not just English. Club Hank & Rumi has thousands of Japanese, Korean, Chinese and Tagalog songs, too. Guests can sing their hearts and vocal cords away Tuesday through Friday, then dance the nights away on Mondays and Saturdays. Tuesday, Wednesday and Thursday they make it easy, offering a Time Service Policy where the customer pays $20 per hour, with drinks and karaoke included in the price. There is a $10 cover charge on Fridays, but it includes the first drink. Karaoke is ¥200 per song, and drinks are at the customer’s discretion from there. Hank livens Fridays too, by offering a ‘Favorite Shooters’ drink as a special. Hank and Rumi know everyone doesn’t like to sing, but still wants to get out and have fun, so they’ve tailored Mondays and Saturdays as ‘no karaoke nights’ in lieu of a 70’s and 80’s Dance Night. The $10 cover charge includes the first drink, and sets the evening for the often older crowd to sit back and reminisce. Hank doubles as the deejay, and takes requests. Dancing is encouraged on the Club Hank & Rumi spacious, lighted dance floor. Club Hank & Rumi opens daily at 8 p.m., and stays open until at least 2 a.m. It’s closed on Sundays, unless a group books a private party. There’s seating for 50 on comfortable leather couches, and the club kitchen cranks out yakitori, pizza and barbeque chicken to curb the often-present munchies. Drinks start at $4, with a full bar available. The club has margaritas, frozen pina coladas and strawberry daiquiris for ¥1,000. The club accepts dollars and yen, but not credit cards. Club Hank & Rumi is located on Highway 58, just north of the Futenma MCAS turnoff. It’s 50 yards from Jimmy’s Supermarket, and has plenty of parking available. 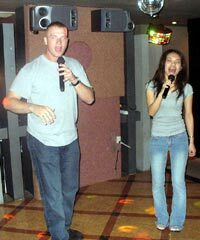 The club website has a full listing of the English karaoke library at www.clubhankrumi.com.